There are many people out there that would like to build an aluminum boat, but don’t have access to a welder that is capable of doing the job. 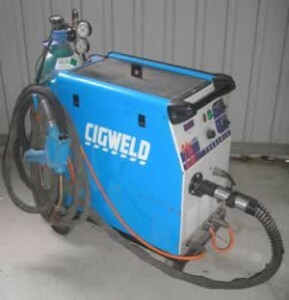 Designer Boats Australia owns a CIGWELD 215se TransMIG welder that is specifically set up for welding aluminum. The welder has been fitted with a push pull gun, were one set of rollers push the wire through from the unit and another set in the welding gun pulls the wire at the same time. This make the wire feed constant/smooth and reduces the risk of jamming. The welder is fitted with an 8m set leads, which I normally position the unit at the back of the boat and I am normally able to weld all around and inside without moving the unit. You will need a 240V 15amp circuit, (20amp circuit breaker) in your workshop to run the welder properly. The recommended wire Alum 5356 and the diameter is 1mm. It has a nylon liner and U-shaped rollers to prevent the wire deforming and arcing in the tip. The welder uses Argon gas in a E2 size cylinder, that can be hired separately from any gas supplier. I will hire the unit out with the gas cylinder but it is simple to arrange and easier if you do it yourself. 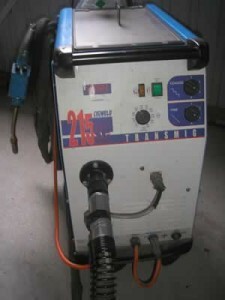 The welder and push pull gun are worth about $3700 and anyone wishing to hire it will need to supply a $2500 holding deposit that is returned to the user on a safe return of the welder. If you would like to hire the welder, please down load the hire agreement from the “General Information Gallery” or contact us, to arrange the hire.